Mr. K is not very pleased with Scottie Mom's absence. 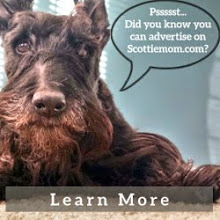 You're not the only one who has felt Scottie Mom's absence lately. In fact, it is pretty obvious that the one who has been impacted most by the extended work hours, reduced play time and less frequent snuggles is Mr. K. He hasn't been too happy with Scottie Mom for taking this new job...even if it does help her buy him more treats and toys. No, treats and toys will never be as good as having a human there to love on you when you want. That, Mr. K knows, can never be replaced. Shih Tzu Mom has been wonderful. She takes Heather and Mr. K out for lunchtime walks each and every day. While I'm sure Mr. K is grateful to her, he recently started protesting these walks and would simply sit down on the grass outside instead of walking around the neighborhood as usual. After some coaxing, he got going but immediately returned to his spot at the bottom of the stairs by the front door the minute they returned to the house. Many a day, Shih Tzu Mom discovered she had to carefully push through a curled up, black ball of fur blocking the front door when she arrived. 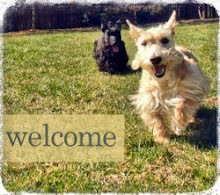 For about a week, Scottie Mom and Dad would return to the Scottie House and notice a smell. Neither could figure out from where it was coming. Mr. K still wasn't very social even with his humans being home and would go to his place at the foot of the stairs. Clearly, he was upset. Scottie Dad went to check on his little buddy and noticed Mr. K had been decorating the wall in various shades of yellow! He got out the cleaning products and set to work on disinfecting that area by the stairs. It has been nearly five years since Mr. K has repeatedly marked his territory to show his discontent but even after so much time, the message is loud and clear as ever. Finally, Mr. K was fed up with it all and let his Scottie-tude get the best of him by taking out his frustrations on Scottie Dad. A low growl here and there. Even a snap once. Things had to change. So, every night after work no matter how late, out comes Mr. K's beloved tennis ball. He chases it to and from with the help of Scottie Mom or Dad until he has run his little heart out and is smiling wide - pink tongue out and all. On weekends, Scottie Mom curls up with Mr. K by the TV or with a good book to make sure he feels loved. The transition certainly hasn't been the smoothest but Mr. K's mood has improved markedly since starting the job nine weeks ago. 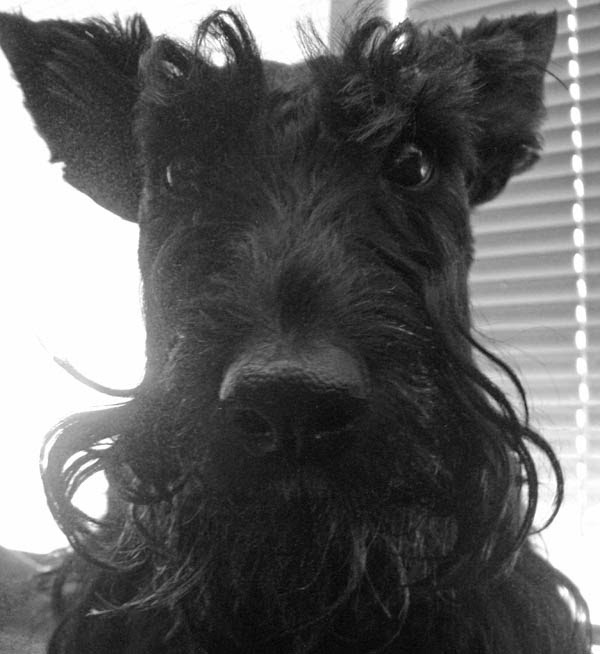 There might not be enough time in the day but there is always time for love and a Scottie dog (or two)! I'm with K-there is no excuse for perpetually being ignored. I tried to yellow the wall but couldn't make it that high. I need lessons. maybe it was Mr. K's special interpretation of 50 shades of yellow? Took awhile, but Mr K got you trained. We think you should have more snuggle sessions. Remember WORK is a four letter word.....just sayin'. They do get their point across, don't they! Glad you are getting the attention you were craving, Mr. K! they need to read "MacDuff and the Baby" - less pee, more sulking. :) same result. Jeez every scotty needs lovin and lots of attention. You were just breaking his little heart not giving him the attention he needed.